A humorous look at the serious issue of climate change from one of the country's most successful young comedians kicks off National Science and Engineering Week activities at the University of Southampton next month. 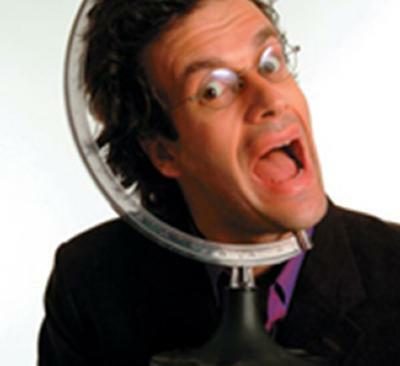 Marcus Brigstocke, stand-up comic, writer, presenter and actor, who is best known for hosting his own live topical BBC television show The Late Edition, is appearing in a must-see comedy show at the Nuffield Theatre on the University's Highfield campus on Monday 10 March. Marcus will be sharing his take on environmental issues with a sense of humour that holds people to account and encourages those with the power to effect change to do so. All proceeds from the event will support 'Discover Oceanography', the South coast's leading public outreach programme for education about oceanography and the environment which is based at the National Oceanography Centre, Southampton (NOCS). The Lighter Side to Science and Climate Change Comedy Show also features Mark Stevenson, Britain's 'premier scientific comedian', with his humorous take on the science of laughter. The Irish Independent called him 'a uniquely funny and unashamedly intelligent comedic talent'. The comedy show is just one of a number of University National Science and Engineering Week events revealing the excitement of science and engineering which take place between Saturday 8 March and Saturday 15 March. Families are invited to attend fascinating exhibitions, interactive displays and lectures at two headline events: Science and Engineering Day at the Highfield campus on Saturday 8 March and Ocean and Earth Day at the National Oceanography Centre, Southampton on Saturday 15 March. Popular TV science presenter Johnny Ball is one of the hosts of invitation-only lectures for local schoolchildren, and tours of the Chilworth conservation area are also on offer. All events are free of charge. The University's Senior Deputy Vice-Chancellor Professor Adam Wheeler says: "I hope lots of people will join us on 10 March for what will undoubtedly be a very funny evening in support of 'Discover Oceanography' and the first of a number of activities we have organised in celebration of National Science and Engineering Week. "But there is a serious message here too. National Science and Engineering Week aims to inspire and excite the next generation of scientists and engineers who are crucial to the economic development of the UK. The events also demonstrate how the University's scientists and engineers are helping to shape the future of our world through their research." The Lighter Side to Science and Climate Change Comedy Show takes place at 7.30pm on Monday 10 March at the Nuffield Theatre on the University's Highfield campus. Tickets are available from the Nuffield Theatre box office on 023 8067 1771 and cost £15.00 (concessions £13.00). A digital image of Marcus Brigstocke is available on request from Communications. The National Oceanography Centre, Southampton (NOCS) opened in 1995 in a purpose-built, £50 million waterfront campus on the city's Empress Dock. A collaboration between the University of Southampton and the Natural Environment Research Council, the centre houses around 520 staff and 700 undergraduate and postgraduate students. Ocean-going Royal Research Ships are also based at the centre.